After two days of surprising weakness in US cash stocks in the last hour of trading, and following an overnight session in which S&P futures were offline for two hours following a "glitch" at the CME Globex exchange, world markets are a sea of red as stocks fell in Europe alongside US equity futures pressured by disappointing corporate earnings and a dramatic escalation in India-Pakistan hostilities after Pakistan reportedly shot down two Indian fighter jets even as traders brace for a barrage of news including the latest Trump-Kim summit, the Congressional testimony by Trump's former lawyer Michael Cohen, and the second day of Powell's testimony on the hill this time before Maxine Waters and AOC. Treasuries yields dropped, as did the dollar. 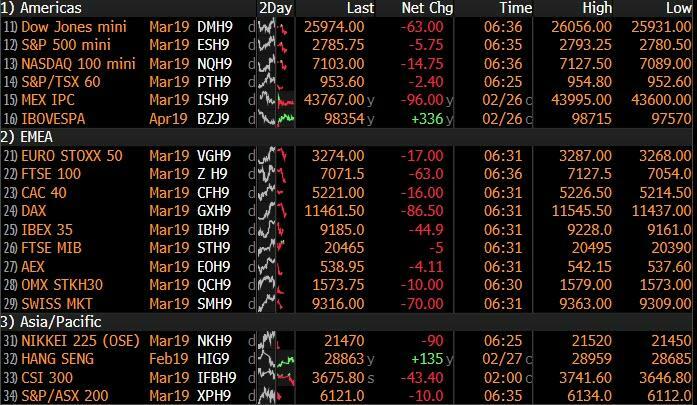 The European Stoxx 600 index was down about 0.5%, with all the main regional indexes were in the red as Air France-KLM dropped the most ever and Nivea hand-cream maker Beiersdorf cut guidance, sparking a selloff in consumer stocks. Earlier, all eyes were on the latest Asian geopolitical conflict: S&P futures fell, Japan equities came off their highs, Hong Kong faded an advance after Pakistan said it had downed two Indian jets, sending Indian and Pakistan bonds and currencies lower and MSCI’s index of Asia-Pacific shares ex-Japan sliding 0.1% as the threat of conflict between the nuclear-armed neighbors grew. Australia's ASX 200 (+0.4%) gains were led by energy names following the rebound in the complex after sources stated that OPEC are to stick to their output curb agreement coupled with bullish API inventory data, while Nikkei 225 (+0.5%) benefitted from the strength in the healthcare sector. Elsewhere, Shanghai Comp (+0.4%) benefited from gains in IT names whilst the latter profited from the strong performance in heavyweight energy and financial names. Meanwhile, just as 2800 has emerged as an uncrossable resistance line for the S&P, China is having the same issue with the 3000 level on the Shanghai Composite as Chinese stocks erased a gain in the afternoon, with the Composite again failing to cross the 3,000-point level after climbing into the bull market earlier in week. 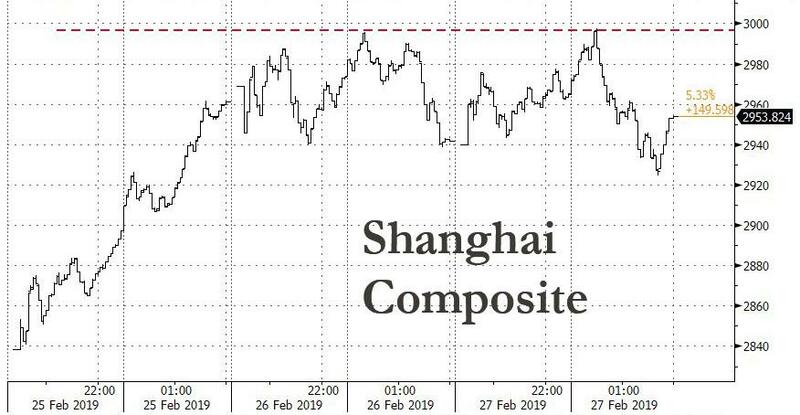 The Shanghai benchmark climbed as much as 1.9% earlier in the day before seeing much of its gains fade and close up just 0.4%. "It was purely a liquidity-driven rebound without the support of fundamentals, so nobody expected the market to embark on another bull run to hit 5,000 points," said Yin Ming, vice president of Shanghai-based investment firm Baptized Capital. "When the index nears the technically important 3,000-point level, investors will choose to exit first and wait for bargains after the correction. With gains in recent sessions, shareholders of firms are finally able to close out their share-pledge positions to repay loans." India’s rupee reversed gains and Pakistan’s benchmark stock index plunged more than 3 percent in Karachi before recovering after the latest escalation in tensions. The Pakistani action came a day after India’s Air Force jets bombed what it said was a terrorist training camp inside Pakistan. "This adds another layer of risks for investors”, said Charles St-Arnaud, a strategist at Lombard Odier, although he noted the market moves remained limited for now. US Secretary of State Pompeo spoke to the Indian and Pakistani Foreign Minister separately according to the US State Department. The Secretary of State urged Pakistan to avoid military action against India following the previously reported Indian air strike on a terrorist camp on Pakistan. Furthermore, at least three Pakistan fighter jets have entered the Indian side of Kashmir, Indian Air Forces intercepted the Pakistani planes; according to an Indian Official. It was later reported that an Indian Air Force jet has crashed in Jammu & Kashmir, according to PTI. Pakistan Foreign Ministry confirms they have shot down two Indian planes and arrested a pilot, states that we have no intention of escalation, but are prepared to do so if forced into that situation. As Bloomberg notes, investors have added the India-Pakistan conflict to a host of other uncertainties from China trade talks to Brexit, that could rein in a recovery in global equities from December lows. U.S. President Donald Trump is in Hanoi for a second summit with North Korean leader Kim Jong Un, with the outcome uncertain. Powell’s testimony on Tuesday helped steady the ship, though, as he gave no indication that the Fed is ready to alter policy any time soon. S&P500 futures were down 0.2%, after earlier a Globex malfunction around 740pm ET halted trading in ES, Treasury and commodity futures, prompting trader anguish for nearly two hours before the "glitch" was eventually resolved. Markets are also watching the U.S.-North Korean summit, which began shortly after 6 am ET in Hanoi. President Trump is meeting North Korean leader Kim Jong Un for their second summit, with the United States pushing North Korea to dismantle its nuclear weapons program. The heightened geopolitical risks helped assets considered safer than stocks, such as the Japanese yen, which gained against the dollar. 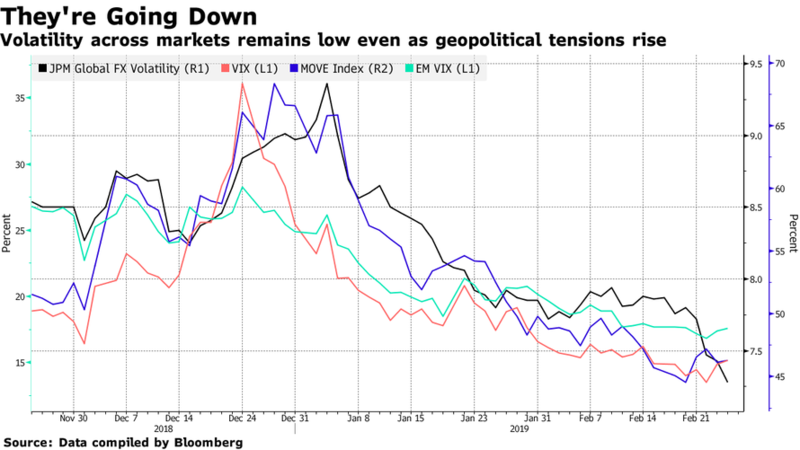 Paradoxically, while news of the worst escalation between the two nations since the 1971 war moved the yen higher and India’s rupee lower, volatility across currencies continued on its downward trend as traders continue to sell vol in droves. In political news, overnight the US House voted to block President Trump's national emergency declaration regarding a Mexican border wall, as expected. The bill will now be passed onto Senate before eventually being vetoed by the president. Of note, also today Trumps's former lawyer Michael Cohen will testify publicly that Trump is a racist, conman & cheat, and that Trump knew ahead of time that Wikileaks were to release Democratic Committee emails hurting Hilary Clinton's election campaign; draft statement. In the latest Brexit news, UK PM May said she is close to winning concessions from the EU that could persuade Eurosceptic MPs to back her deal. More notably, Brexiteer Jacob Rees-Mogg has softened his stance on PM May's Brexit deal; he is no longer insisting the Irish backstop be scrapped and he is prepared to consider other legal fixes to make sure it does not become permanent. Cabinet Ministers warned PM May that Brexit could be delayed by up to two years after she announced a series of votes on her deal, no deal and a Brexit delay to be held in a fortnight. Meanwhile, the newly-formed Independent Group has tabled an amendment demanding the government to commence preparations for a second EU referendum. The amendment reportedly has support from the SNP, LibDems, and Plaid Cymru and is said to be aimed at provoking a fresh split in the Labour party by tempting MPs who are seeking a new vote. In FX, the dollar hovered around a three-week low after Federal Reserve Chairman Jerome Powell reiterated on Tuesday the Fed had shifted to a more “patient” policy approach regarding changes to interest rates. 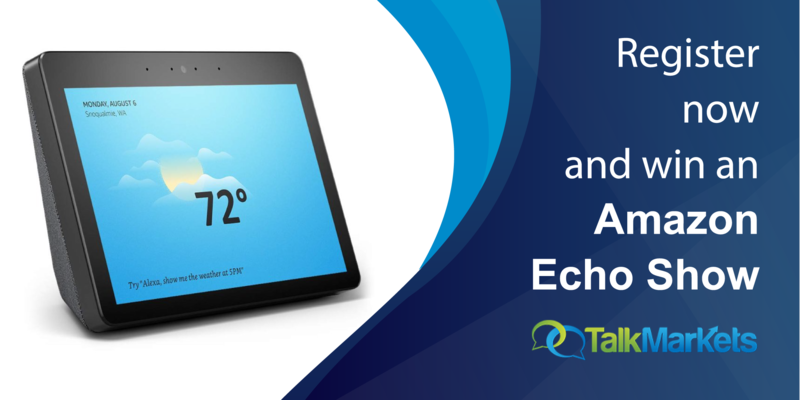 “We didn’t learn much new,” St-Arnaud said. The new dovish stance of U.S. monetary policy had not weakened the dollar much, notably against the euro.